A Wrightsville Beach town employee was charged with driving while impaired and drug offenses after he crashed the town vehicle he was driving into a parked car on Wednesday, April 11. Wrightsville Beach Police Chief Dan House said that Joshua Lovato, 42, was charged with DWI, careless and reckless driving, injury to property, and possession of narcotics after the wreck on North Lumina Avenue. Lovato, an employee of the Wrightsville Beach Public Works Department, was driving a department truck north on North Lumina Avenue when he struck a dark-colored Volvo that was parked on the east side of the road in the 300 block. The truck hit the rear end of the car, which wasn’t occupied at the time, House said. The force of the collision carried both vehicles to a rest on the west side of the road. Lovato suffered minor injuries and was taken to the hospital, but was later released. One witness told Lumina News that Lovato got into an altercation with a bystander, however, House could not confirm it. Lovato was released on an unsecured bond, House said. The DWI charges came after blood was drawn, House said. 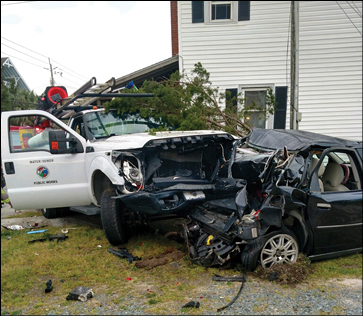 Town Manager Tim Owens said that Lovato has not been terminated, but has been placed on administrative leave with pay while town officials investigate the circumstances behind the wreck. Owens wasn’t able to provide information about how long Lovato has worked with the town, but House said he believed it was more than one year.